One hundred years ago this month the Cork Fever Hospital hosted their annual general meeting. The hospital had a distinguished career caring for Corkonians since 1802 and was located atop the Fever Hospital steps adjacent Our Lady’s Well in Blackpool. It was founded by Corkman Dr Milner Barry who introduced vaccination into Cork in 1800, and was the first to make it known to any Irish city. In 1824, a monument with a long laudatory inscription was erected to his memory in the grounds of the Fever Hospital by Corkonians. 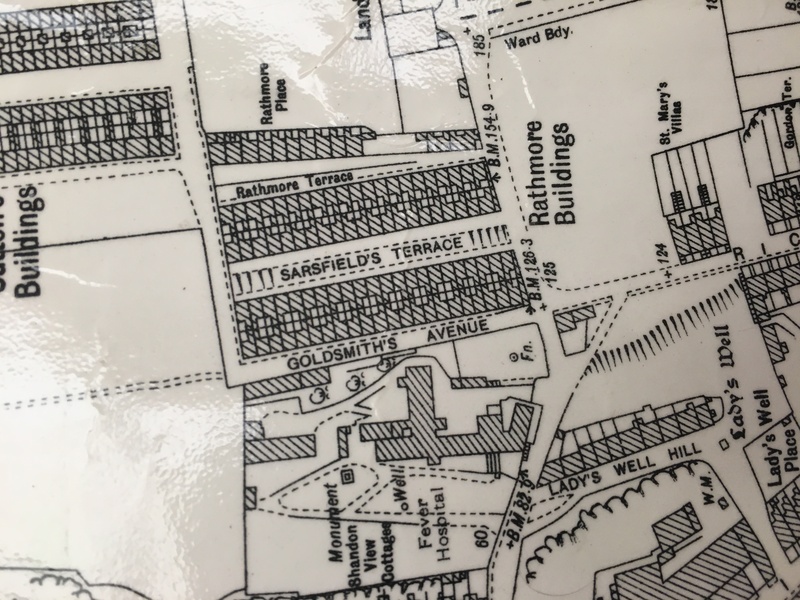 The hospital site was sold off in 1962 and the housing estate of Shandon Court stands in its stead. The annual general meeting of the President and Assistants of the Cork Fever Hospital and House of Recovery was held on 15 May 1917 in the Crawford Municipal School of Art. The annual report of the Hospital Committee was read by member Sir John Scott. He revealed that on 1 January 1917 there were 37 patients in the hospital and 256 were admitted during 1916. This made a total number of 293 patients treated, compared with 500 during the year 1915. Of the patients treated 253 were discharged and cured whilst 11 remained in hospital on 31 December 1916. There were 24 deaths during the year, and it was noted, with great regret, that many of them were only brought to the hospital in a “hopeless condition”. Deducting these from the number of deaths the mortality showed a low rate namely 6 per cent, which was deemed by the committee as a “satisfactory outcome” with dealing with dangerous life-taking fevers. A regular call was made by the Fever Hospital urging upon Cork citizens the immense importance of prompt isolation and hospital treatment for cases of infectious diseases. Many of the cases treated came from the thickly populated districts the city. Of the cases admitted 108 came from the north side of the city, 54 from the south side, 53 from the centre and 25 from the rural districts. A considerable number of military cases were treated. One soldier, having returned to his home in England, wrote a letter to Dr Sutton, the Resident Medical Officer, thanking him and the medical staff for their “excellent treatment” which he had received. He stated that he had been in hospitals in various parts of the world but that he never got better care and attention than he received in the Cork Fever Hospital under Dr Sutton and Miss McCullagh, the Matron. The Committee regretted to report that a case of typhus fever was admitted to the hospital from a Cork locality. It was some years since there was a case of typhus fever in Cork, mainly owing to the excellent and watchful eye of the officials of the Public Health Department of Cork Corporation. They were active in their endeavours to promote cleanliness, and to guard against overcrowding in congested areas, and thus prevent the outbreak and spread of any infectious diseases. In the report of the Medical Staff, read by Dr O’Callaghan, he called upon parents and guardians of unvaccinated children – a substantial number of whom were in the city – to have them immediately vaccinated, as there was every danger that the disease, small pox, might be brought into the country by some of those returning from the various fronts of the War. It was hoped that that the Board of Guardians, who were responsible for the enforcement of the Vaccination Act, would insist on it being complied with by parents and others in charge of children. Under the amended 1907 Act the parent could escape penalties for the non-vaccination of his child if within four months from the birth he/she made a statutory declaration that confidently believed that vaccination would be prejudicial to the health of the child. The high prices of the cost of living added considerable expense of maintaining the Fever Hospital. It was acknowledged that the cost of treating fever patients was heavy. The increase in prices was shown by a comparative return made by the Auditor, who pointed out that in the year 1913, before the war, the cost of food and necessaries amounted to £416 14s 7d. During 1916-17 the cost under the same headings came to the large sum of £850 8s 2d, being a rise of over 101 per cent. The treasurer’s report showed a balance due to the bank of £1,466 5s. The cash received from Cork Corporation was £1,500 from the County Council, £100, from subscriptions £101 15s, and from paying patients £556 9s. The committee noted an increase under the head of subscriptions and also of paying patients. The Hospital Aid Society sent £11 and the Hospital Saturday Fund sent £16. Early in 1917 because of the heavy debt, which had accumulated on the Fever Hospital, the Committee made a special appeal to the public with a view to reducing the bank debt. The appeal met with considerable success with a sum of £819 9s 4d being fund-raised. This included £30 3s 0d, an amount realised by the proceeds of a bridge tournament kindly held by the Lady Mayoress, Mrs Butterfield.